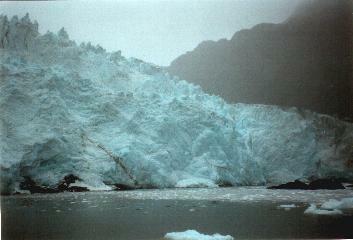 SEWARD, AUGUST 1997 - The kenai penninsula is known for its marine wildlife and glaciers that end up into the ocean. The best way to experience all of this is by taking a boat trip... But as always with wildlife watching, you have to be lucky to see something... and the weather can block much of sight onto the glaciers. That morning, it was misty and rainy. Not exactely a big day for this kind of trip. In the beginning, there was not much to see, except for the puffins, several sea birds, and the funny sea otters... When on the deck of the boat the wind and rain were challenging the quality of your raincoat. Not exactely a great trip. But this all changed when the sea lions came into sight. Hundreds of them lying on the rocky coast. 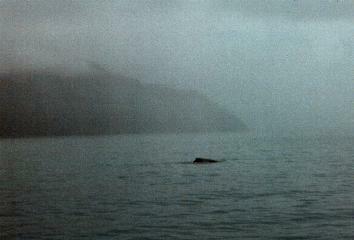 The boat stayed at a 'safe' distance, in order not to interfere with these animals. The sounds of the sea lions were however reaching us loud and clear. Later on, someone spotted some dolphins swimming along with the boat. Dolphins seem to like to do this. 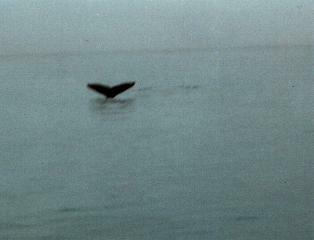 Sometime later, the ocean had another surprise for us : whales ! Everyone rushed to the side of the boat where they where spotted. Big exitement on the boat, rain and wind were forgotten now. The captain of the boat tried to follow the whales, from a distance, but this seemed a rather difficult task : you could never tell where they would surface from the water again. However we had a couple of minutes till they were gone - some very special minutes in the company of the giants of the ocean. Along the way the boat stopped to eat some Alaska salmon, which is always great food. After lunch, it was glacier time. One of the big attractions on such a boat trip is to pass by a glacier (not too close however) at the moment a large chunk of ice falls into the water. The sound and movement of the water is thrilling ! Since it was misty, only half of the glacier walls were visible, but still, these were impressive masses of ice. Notwithstanding the bad weather, this was still a trip I can higly recommend.